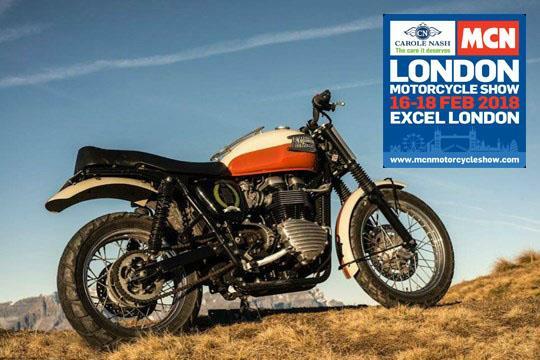 A Bonneville that used to belong to Hollywood star Brad Pitt will be put under the hammer at the Coy’s auction at this weekend’s Carole Nash MCN London Motorcycle Show. The 2009 Triumph Bonneville Bud Edkins Desert Scrambler Special beloged to Pitt and will go up for sale at auction this Saturday 17th Feburary as international auctioneers Coys return for their third year at the show. The machine was built by Brad Holstein on behalf of Triumph and given to Brad Pitt as a gift reportedly from the Ocean’s Elven producer Jerry Weintraub with the petrol cap engraved with his birthday message. In good, all-round condition, the bike retains its registration plates and is estimated at £20,000-£30,000. Other motorcycles on offer include the 26th out of the 50 produced 2016 Norton Domiracer (£35,000 -£45,000), an original UK delivered 1996 Honda RVF750R/RC45 (£25,000 - £30,000), a 1938 Ariel Square Four (£12,000 - £17,000), a 1976 Laverda 3C (£13,000 - £16,000) and a 1930 Rudge Ulster to Grand Prix Specification (£12,000 - £16,000). The 1949 HRD Vincent Rapide Series C 998cc on offer is one of the gems that can be found in the catalogue. It was manufactured in 1949 , during the transition period in which HRD Vincent changed their trading name to purely Vincent. Evidence of the transition can be seen in the engine as later models just had the Vincent name rather than HDR. This model “FPY 327” was restored by expert Martin Quirk, a very well-known and successful Vincent period road racer who only works on Vincents. The careful process took 12 year and since restoration it has only covered less than one mile. This highly original bike is certainly a wise investment. Another gem is the Norton Domiracer #26. An ultra-rare and simply stunning bike that can only be described as a masterpiece. It is a completely handmade British machine with each component completely crafted to the highest specification, including carbon air box, carbon front mudguard, carbon seat, race exhausts (plus original road versions), Brembo brakes, hand beaten tank, and more. This particular model was registered early in 2015 and has been on display since new in the owner’s collection, who only used it sparingly. It is supplied with the factory handbook pack and the UK V5C logbook. The bike sale coincides with a second Coys auction taking place simultaneously on Saturday next door at the Historic Motorsport International show in association with the London Classic Car Show.